The final United States Mint numismatic product sales report for this year includes the debut of the Franklin D. Roosevelt Coin & Chronicles Set. The 2014-dated commemorative coins saw relatively subdued movement as they drew closer to the conclusion of sales. On December 22, the US Mint began accepting orders for the Franklin D. Roosevelt Coin & Chronicles Set. This product followed last year’s issue of a similarly themed set for Theodore Roosevelt. 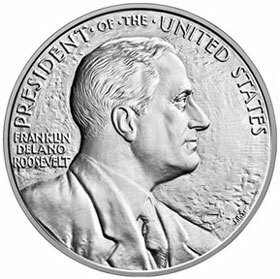 The new product contained proof examples of the 2014-dated Franklin D. Roosevelt Presidential Dollar and Roosevelt Dime. These coins were accompanied by bronze and 1 oz silver versions of the Roosevelt Presidential Medal and four USPS stamps. The sets were priced at $57.95 and carried an overall product limit of 20,000 units. Through the reporting date of December 28, the Mint has received orders for 8,074 sets, accounting for just over 40% of the product limit. Last year’s set featuring Theodore Roosevelt had sold out when sales reached 15,144 units. As covered in the previous report, the US Mint announced the conclusion of sales for the 2014-dated commemorative coins on December 30, 2014 at 12:00 Noon. The impending deadline did not result in any large shifts in the rate of sales through the reporting date. The 2014 Baseball Hall of Fame Silver Dollars, which had briefly gone back on sale, showed increases to bring the overall total sales back to the mintage limit of 400,000 pieces. The half dollars added 7,312 units across the individual proof and uncirculated versions along with an additional 379 within the Young Collector’s Set. Across all options, the half dollars now show sales of 436,163 units from the 750,000 maximum mintage. The 2014 Civil Rights Act of 1964 Silver Dollars showed a small increase for the sold out uncirculated version to 24,591 units. The proof version added 465 units to reach cumulative sales of 61,317 units. Across both versions, the sales of 85,908 represent 24.5% of the maximum mintage of 350,000 pieces. Amazing that they “still” are still selling spouses from 2013 that came out over a year ago. In fact one can buy some 18 different ones from way back. They need new designers. Ones that know something more than flowers. They shoulda woulda coulda musta just put the wives with their husbands with a common OBS front perhaps. Or copied the sub series for several coins. They must hire their artists from the FLOWERS business – florists international! Their net sales for the week were MINUS (-14) fourteen coins on all 18 separate spouses that are gold 1/2 ounce coins – they offer. US Mint faces some 18 gold coins with a weekly negative 14 sales, wow! Sales will soon pickup on the Spouses, rendering them to total bullion coin status. But then isn’t that all they ever were? As of this moment (Jan. 2, 11:15 pm EST), the 2013 Uncirculated sets are are once again marked “Sold Out” on the US Mint website. Is the third time the charm? Errors = Yep, I agree, however that BULLION value may matter this year. “MAY!” in capitals. Funny what happens if like in 1974 it goes up 8 to 10 times.